Trina McKillen, "Confess" (Installation view: Lisa Sette Gallery). Eight years ago, the Irish-born artist Trina McKillen returned to Dublin to discover that her elderly mother no longer wanted to go to Mass—the ongoing revelations of clerical child abuse were just too much. The body of work consists of a series of pieces that evoke the grief and horror that surround the sexual abuse crisis. What came of that desire to help her mother and others like her is “Confess,” an art exhibit having its Los Angeles debut over the next two months at L.M.U.’s Laband Art Gallery. The body of work consists of a series of pieces that evoke the grief and horror that surround the sexual abuse crisis. “Bless Me Child For I Have Sinned” is an exquisitely crafted life-size glass confessional, with a white child’s chair sitting in the place normally occupied by a priest. In “The Children,” 20 altar server garments and 20 First Communion dresses hang in a small, red-curtained room; in “Stations of Hope,” a darkened space holds 14 framed stations offering a set of faint twinkling lights. The idea of mounting an exhibition that takes on the crisis of abuse and cover-up in the Catholic Church seems both essential for the Catholic community right now and near impossible to render palatable. Ms. McKillen had no illusions her work would be easy: At the exhibit’s opening she described dinner parties where artist friends would “recoil” when she mentioned the work she was doing. She felt “unbelievable anxiety” at the thought of how Catholics might respond. In retrospect she did not have to worry. More than anything, what distinguishes this exhibit is its respect and care for the viewer. Rather than rubbing our faces in the horror of what has happened or trying to convey some sort of pedantic message, what Ms. McKillen sets out to offer with “Confess” is a set of contemplative spaces in which people are allowed to get in touch with their own varied feelings and experiences. For instance, in the central piece of the exhibit, the glass confessional, there are no figures present, no priest nor child. 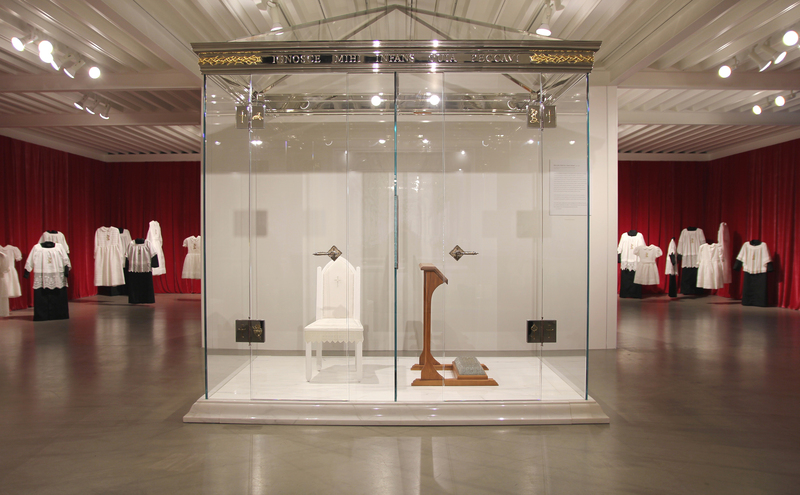 There is just the hand-carved wooden kneeler on one side, and across a glass screen a small white chair with a tiny cross sewn into the back and lit from within. With its pure white color and frail, slightly bent legs, the chair evokes vulnerability and innocent childlike beauty. But that is as far as Ms. McKillen takes it. The rest is up to us to bring, which as it turns out is a tremendous gift; for as much as we have heard and read about the abuse crisis over the years, standing before this empty confessional you come to realize how rarely we have been invited within or outside the church to simply be with and process that reality. The emptiness and transparency of the confessional in a sense provides a space outside of us in which we can place our feelings and look upon them. In the second room, 40 children’s church garments hang on thin transparent strings, each at a child’s height. The air currents in the room cause some of the garments to occasionally sway in ways that are uncannily child-like. Once you are aware of the motion it becomes clear that almost all of the figures are moving at least slightly. The room is so small that only a few people can enter at any one time. The space becomes an invitation to a profoundly personal experience. It is a space for you to be with your thoughts and feelings. And the longer you stay, the more the garments shift from a set to distinct individuals: the little girl in her baptismal dress who stands in the corner of the room by herself, her belt tied in the front in a whimsical white bow; across the room, a taller, slightly older girl, the front of her lace dress almost heart-shaped in pattern. “The children were silenced,” Ms. McKillen comments in her description of the piece. Perhaps the most mysterious piece of the exhibit is the last room, which is filled with tiny squares of Irish linen framed and lit from within. Nothing here explicitly suggests children, abuse or for that matter the church. Yet when Ms. McKillen first set out to create some sort of response to the abuse crisis, it was with these small linen fragments that she began. She had fond memories of two aunts working in a textile factory in Northern Ireland, and found creating these little rectangles out of linen comforting. “I’m just doing them because they make me happy,” she told her parents. Over time she came to see the linen cuttings as a sort of poultice, a bandage used in healing. And in that dark room there is a sense of each piece of cloth caring for or protecting something precious. A tiny light—similar to a devotional candle—flickers behind or within each piece of linen. Most are dim, their fragility suggesting vulnerability or perhaps brokenness, convalescence. But once you have been there a while, you begin to notice some of the lights occasionally brighten. Here and there (all around you, in fact) the dim flickers are replaced by beams that pour out from the linen like the rays of the sun. Each beam is almost a notice that something is freed; a life is transfigured. In the face of the abuse crisis so many of us feel like Ms. McKillen’s mother, orphaned and grief-stricken. Paradoxically, by offering people a holy space in which to consider their own feelings of outrage and devastation, “Confess”offers the possibility of something more—a release of sorts, and a sense of being on a path, finally, toward home. “Confess” is on view at L.M.U.’s Laband Art Gallery from now until March 23. Admission is free. The university is also offering a series of lectures, prayer services and other conversations in conjunction with the exhibit. More information can be found at cfa.lmu.edu/labandgallery/exhibitions/. This seems like a very potent art exhibit. I like the idea of using art to help unwind the many knots of pain. The part that uses children's sacramental type clothes in the wind to make them appear as moving children I can almost picture this in my mind. I so wish I could experience this show. I hope it travels!! thank you for this brave attempt Ms McKillen to get our heads around the unthinkable. This exhibit is probably worth more than a thousand Bishops' prayers. This sounds like a gorgeous installation. Thank you for sharing it so evocatively. It is painful to me that a Jesuit priest would suggest that this gorgeous show is the rare opportunity ------- "within or without the church, that we have been invited" --------- to simply be with our own feelings about the reality that men who professed to God's sacred hands --- and ears ----- on Earth committed these crimes of the spirit, these crimes of the body, these crimes of the sanctuary. If ever there were a context in which the individual hundreds and thousands of first person singular tellings of these violations by God's own hands on Earth should have been enough, it is the church. Perhaps the "we" who require the disembodied intimacy of art to truly experience this reality is not the universal "we" to whom art is offered. Perhaps the very specific "we" and "you" of Father Jim's review is the collective and the individual, Roman Catholic priests everyone of you, whether or not you committed the crime. If so, it is a blessing to the universal church you priests finally have that invitation in this extraordinary art piece ----- and it is a tragedy of proportions unimaginable that the voices, one by one, of victims the very first time they came, one by one, asking sanctuary, were not enough. That is the reflection I pray Fr Jim and other priests moved by this show ask themselves: Why can *******I********* and **********we********* hear THIS invitation, as Fr Jim charaterizes the show, when **********I************ and ****************we************ failed to hear the invitation offered by individual and collective voices of victims and brokenhearted/soul-sick laypeople in ************my************ and ***********our*********** offices and, shatter-our-souls, confessionals? Perhaps this was an opportunity for Fr Jim to set aside the privilege of speaking to us the non-clerics in the church and instead speak to you, the clerics, in our presence. We ----- the non-clerics ----- have been fully in touch with our feelings and experiences; we relive those experiences and feelings every time we hear another one of our Catholic brothers and sisters reveal what happened to them and we relive our feelings every time we go to Mass or try to go to Mass. This article also appeared in print, under the headline "A profoundly spiritual art exhibit about the abuse crisis," in the March 18, 2019 issue. Jim McDermott, S.J., is America’s Los Angeles correspondent.